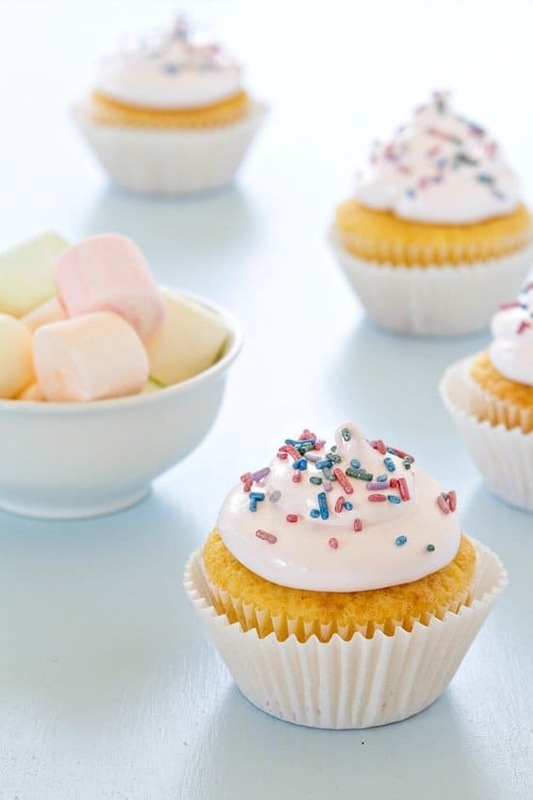 Marshmallow frosting made with Campfire® Fruit Swirlers is the perfect topping for cupcakes. 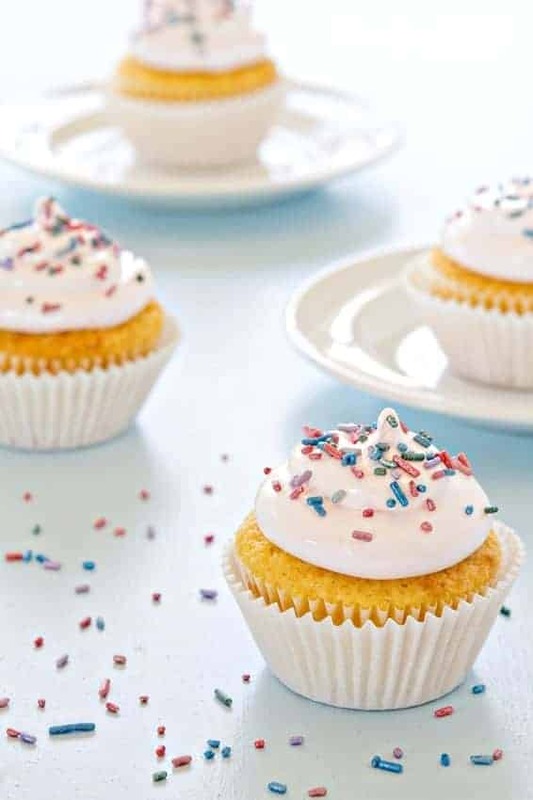 The sweet and fruity flavor makes this frosting delightful for spring. Since we’ve moved, one of the most commonly asked questions is, “Do you miss Toledo?” The short answer is.. no. Because it’s not the area that we miss, it’s the people. Our amazing neighbors, friends, hair stylist, dog groomer, etc. And the local bakery, which isn’t necessarily a person, I realize. But I love their frosting, so when I’m listing the people I miss, the bakery gets included, and so does Kroger. Yes, guys I miss a bakery because they have the most amazing cake and frosting on the planet. Eric actually drove 3 hours round trip to Toledo for my birthday last month, just to pick up a Strawberries and Cream cake. My favorite not-made-by-me cake – in case you were wondering, this most definitely means that I win in the husband department. I’ve been dreaming about frosting since we finished it – about 48 hours after Eric returned with it. Luckily we had some help in the eating department, otherwise I may have finished the entire thing on my own. It’s some seriously good cake, and some SERIOUSLY good frosting. Driving three hours for cake seems a little ridiculous when it’s not a birthday gift, so I decided so calm the craving with homemade marshmallow frosting. It’s not the same as that amazing Toledo frosting, but let me tell ya – it’s pretty dang delicious. Yesterday, I woke up super early and decided to whip together a batch of cupcakes. I needed something to slather this magical marshmallow frosting onto, and let’s face it, eating out of the mixing bowl with a spatula would’ve happened. And since our summer vacation is less than 3 months a way – that simply can’t go down. While I’ve been pretty obsessed with all things marshmallow since I was kid, I’ve never tasted marshmallow frosting made with actual marshmallows, so naturally, I had to make that happen. And although I toyed with the idea using plain white marshmallows for this recipe, I ended up choosing Campfire® Fruit Swirlers. If you’ve never had a Campfire® Fruit Swirler, you are most certainly missing out. They’re bite size marshmallows that are exploding with fruit flavor. My dad is wholeheartedly in love with these marshmallows to the point that he can polish off an entire bag in about a day. I chose to use all strawberry flavored Fruit Swirlers in this recipe because I loved the idea of a pale pink frosting. However, you can use a combination of all 4 flavors, or even use Campfire® Mallow Bursts. The Fruit Swirlers did impart a slight fruity flavor to the marshmallow frosting, but the true vanilla marshmallow goodness definitely shines through. Random fact – did you know marshmallows are sold as candy in the U.K., rather than an ‘ingredient’? The things you learn when your bestie is married to a Brit. I guess it gives my dad a little more justification for eating them by the handful, right? I gotta warn you though, this frosting is bit more involved than a typical America-style buttercream because there is a cooking component, but I promise it’s super easy. And the light, fluffy texture is seriously amazing, so it’s definitely worth the 10 minute cook time. Trust me, you’ll be eating it with a spoon, spatula, and your fingers. Just don’t touch anything after! As you may remember from my Ambrosia Trifles, I’m partnering with Emily from Jelly Toast and Campfire® Marshmallows. You’ll see more recipes from us, and even more exciting stuff as the year goes on. 1. Place egg whites, sugar, corn syrup and water in the top of a double boiler. Beat with a handheld electric mixer for about 1 minute. 2. Place pan over boiling water. Make sure the boiling water does not touch the bottom of the top pan. Beat constantly with an electric mixer on high speed for 7-8 minutes, or until it is stiff and glossy. Beat in vanilla and marshmallows. Continue beating until marshmallows are melted and frosting is smooth; about 2 minutes. Use immediately. 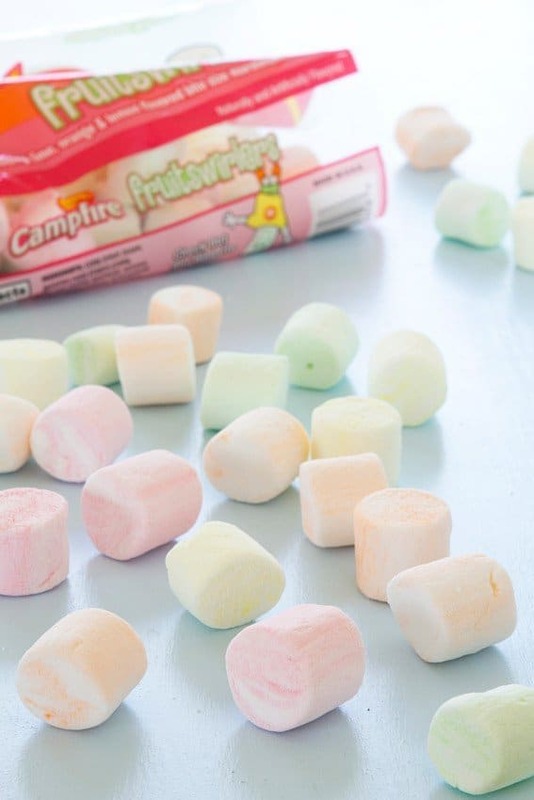 - You can substitute 2 cups plain miniature marshmallows for the Campfire® Fruit Swirlers. - This marshmallow frosting will hold up to basic piping. I just snipped the bottom of a piping bag off and piped without an attached tip. You could also use a zip-top bag for this purpose. - This marshmallow frosting is best served the day it is made and tastes best when it is at room temperature. - One batch makes enough to generously frost 18 cupcakes. 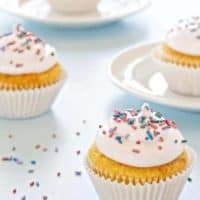 I’ve never thought of marshmallow frosting but it sounds delicious! You certainly do win in the husband department, how sweet is that guy?! Great recipe! I think you would love the marshmallow frosting! Thanks for visiting. Here is Australia marshmellows are lollies, never thought of as an ingredient! But this won’t stop me from making this frosting. Mmm double choc brownies with roasted nuts and marshmellow frosting! Sounds like a challenge for this weekend!! That sounds amazing, you will have to let me know how it turns out. Thanks for visiting! I’m so dreaming about this frosting too! I hope you get the chance to try it! Thanks for stopping by. I want to try this but I can’t find the marshmallows! Where did you find them? Walmart, World Market and other specialty food stores usually have the Campfire brand. You can also try Amazon. I hope this helps. I hope you like this frosting. Thanks for stopping by. Hi Roslyn – This marshmallow frosting is best served the day it is made and tastes best when it is at room temperature. Thanks for stopping by. Happy baking! I’ve tried this today and it’s awesome! My 8 year old hates buttercream and I’m sure she’ll love this. I am so happy to hear that you enjoyed the frosting! Thanks so much for stopping by and leaving your feedback. Have a great day! I always watch your youtube channel and love your tutorials. Thank you! I am in need of a marshmallow frosting and I found this one. I am making s’mores cupcakes and would like to use a small kitchen torch to give the apperance of a toasted marshmallow with some graham cracker crumbles and a small chocolate bar on top as a garnish. Do you think your receipe will hold up to all that? If not, is there something else I can add to stablize it a little better so it will? If, not do you have an alternate receipe you could recommend? Hello! I haven’t tried torching this recipe, but I think it will work just fine! It’s very similar to 7-minute frosting which torches us beautifully. I hope this helps. Sorry forgot to ask a question. I know you said this receipe works best serve the day it’s made, but do you know if it will hold up in the refrigerator at all, or no? It will hold up in the refrigerator. Definitely pipe the frosting on the cupcakes immediately and then refrigerate before serving. I hope this helps. Hi…this sounds delicious….do you know if this frosting is stable enough to go into a layered cake covered in fondant for 1-2 days? Thanks! I don’t think this frosting would suitable for fondant. I hope this helps. This frosting does not set up like a buttercream, it’s quite soft and sticky – much like a 7-minute frosting. I hope this helps. I want to use this for a substitute to swiss meringue frosting recipe for a layer cake, do you think it will be sturdy enough? Hi, Samantha! I think Swiss meringue should be fine. Let me know how it turns out! But I only have a stand mixture. Can I melt everything, mixing with a whisk then transfer it to the stand mixture to finish whipping it? Sure! I think that will work just fine. hi, this is what i wanted, easy with ingredients I can just get in my kitchen, question is how long do i have to transfer the mixture to the bag? does it reareally get too sticky to handle? or did i do something wrong? help! thank you..
Hi, Nerie! I would recommend transferring the frosting to the bag as soon as possible as the frosting will be easier to handle that way. Let me know if you have any more questions! I hope you enjoyed it! Hi, Holly! I think rice malt syrup would work just fine! Let me know how you like it! I did this frosting but when I put it in the piping bag it was a bit too soft . I tried doing swirls but it spread is it because it was still warm. It got firmer on the cupcakes once it was cool down. I’m glad it worked out for you, Jane! Hi, Amanda! I’ve never tried this, but I’ve heard of people using maple syrup or raw honey as a substitute for corn syrup. Let me know how it goes! I want to make this today, but I don’t have any syrup. Could I use jam instead? Or what would you suggest? Hi, Cyndi! You could try two teaspoons of water with a little sugar added. I hope you like it! Tried the frosting today, I was super worried I had screwed it up, since I halved it and was using really old mini marshmallows, but it turned out really well. It tasted like marshmallow fluff…it was great! Thanks fur the recipe! Forgot to mention, I didn’t have corn syrup so I used golden syrup instead. Hi, Shanel! Combine 1 cup of sugar with 1 cup hot water. Measure 2 teaspoons and add it to the pan. I hope you enjoy it! We are doing a ghostbusters theme for my son’s party and the kids will be decorating their own cupcakes. I wanted to make this ahead of time and portion the icing into sandwich baggies (and cut the end for them to pipe when ready) for less mess. Do you think if made the day before and left in room temp it would still be good, fresh, and fluffy? Also, if using plain marshmallows (or mini) rather than the fruit swirlers, how much do you recommend? Thank you so much! I would definitely skip this recipe as it won’t be stable enough to keep at room temperature overnight. I did make these cute, cheesecakes that have adorable Ghostbusters printable tags. They could be super cute for a themed party. Thanks for stopping by. Hi! I was going to make white owl cupcakes with this frosting. Do you think it would hold halved oreo cookies well? It’s for a baby shower. I think it probably would, Kat. Let me know how it goes! I’m planning on making this tomorrow to fill a lemon cake – I plan on using it with lemon curd for the middle of the cake, and for the top, to go under a meringue layer. Does the marshmallow frosting become sticky enough to grip the layers, or do you think they will slip too much? Hi, Nicola! I think the marshmallow frosting should work just fine. Let me know how it turned out! Here in the UK my make what we call Toffee Marshmallow Crispy cakes. We melt together a bag of toffees and a bag of marshmallow, then your stir in crisped rice breakfast cereal (Most kinds work). Press into an oiled tray and mark into squares before cool. I’d like to use this as a filler layer between two cakes. If I frost the cake in the morning and it is not eaten until later in the evening on the same day, will it still be okay? Will it hold up to a cake layer on top of it? Thank you!! I haven’t tried this frosting on a cake, but I think it will be fine as long as it’s not subjected to a warm environment. Thanks so much! Thanks for stopping by, Jasmin! Enjoy! Can this frosting be dipped in chocolate? Hello! I haven’t attempted dipping this recipe in chocolate, so I am not sure of the result. If you happen to give it a try, I’d love to know how it turns out. Thanks so much for stopping by. So happy to hear you enjoyed the frosting, Melissa! Thanks so much for stopping by and leaving your feedback! S’mores cupcakes. The frosting toasts beautifully! Thanks so much for stopping by, Luke! I appreciate you taking the time to comment. Happy Baking!